This article is about fuel coke derived from coal. For fuel coke derived from petroleum, see Petroleum coke. For other things called "coke", see Coke (disambiguation). Historical sources dating to the 4th century describe the production of coke in ancient China. The Chinese first used coke for heating and cooking no later than the ninth century. By the first decades of the eleventh century, Chinese ironworkers in the Yellow River valley began to fuel their furnaces with coke, solving their fuel problem in that tree-sparse region. In 1589, a patent was granted to Thomas Proctor and William Peterson for making iron and steel and melting lead with "earth-coal, sea-coal, turf, and peat". The patent contains a distinct allusion to the preparation of coal by "cooking". In 1590, a patent was granted to the Dean of York to "purify pit-coal and free it from its offensive smell". In 1620, a patent was granted to a company composed of William St. John and other knights, mentioning the use of coke in smelting ores and manufacturing metals. In 1627, a patent was granted to Sir John Hacket and Octavius de Strada for a method of rendering sea-coal and pit-coal as useful as charcoal for burning in houses, without offense by smell or smoke. In 1603, Hugh Plat suggested that coal might be charred in a manner analogous to the way charcoal is produced from wood. This process was not employed until 1642, when coke was used for roasting malt in Derbyshire; previously, brewers had used wood, as uncoked coal cannot be used in brewing because its sulfurous fumes would impart a foul taste to the beer. It was considered an improvement in quality, and brought about an "alteration which all England admired"—the coke process allowed for a lighter roast of the malt, leading to the creation of what by the end of the 17th century was called pale ale. In 1709, Abraham Darby I established a coke-fired blast furnace to produce cast iron. Coke's superior crushing strength allowed blast furnaces to become taller and larger. The ensuing availability of inexpensive iron was one of the factors leading to the Industrial Revolution. Before this time, iron-making used large quantities of charcoal, produced by burning wood. As the coppicing of forests became unable to meet the demand, the substitution of coke for charcoal became common in Great Britain, and coke was manufactured by burning coal in heaps on the ground so that only the outer layer burned, leaving the interior of the pile in a carbonized state. In the late 18th century, brick beehive ovens were developed, which allowed more control over the burning process. In 1768, John Wilkinson built a more practical oven for converting coal into coke. Wilkinson improved the process by building the coal heaps around a low central chimney built of loose bricks and with openings for the combustion gases to enter, resulting in a higher yield of better coke. With greater skill in the firing, covering and quenching of the heaps, yields were increased from about 33% to 65% by the middle of the 19th century. The Scottish iron industry expanded rapidly in the second quarter of the 19th century, through the adoption of the hot-blast process in its coalfields. In 1802, a battery of beehives was set up near Sheffield, to coke the Silkstone seam for use in crucible steel melting. By 1870, there were 14,000 beehive ovens in operation on the West Durham coalfields, capable of producing 4,000,000 long tons (4,480,000 short tons; 4,060,000 t) of coke. As a measure of the extent of the expansion of coke making, it has been estimated that the requirements of the iron industry were about 1,000,000 long tons (1,120,000 short tons; 1,020,000 t) a year in the early 1850s, whereas by 1880 the figure had risen to 7,000,000 long tons (7,800,000 short tons; 7,100,000 t), of which about 5,000,000 long tons (5,600,000 short tons; 5,100,000 t) were produced in Durham county, 1,000,000 long tons (1,120,000 short tons; 1,020,000 t) in the South Wales coalfield, and 1,000,000 long tons (1,120,000 short tons; 1,020,000 t) in Yorkshire and Derbyshire. In the first years of steam railway locomotives, coke was the normal fuel. This resulted from an early piece of environmental legislation; any proposed locomotive had to "consume its own smoke". This was not technically possible to achieve until the firebox arch came into use, but burning coke, with its low smoke emissions, was considered to meet the requirement. This rule was quietly dropped, and cheaper coal became the normal fuel, as railways gained acceptance among the public. In the US, the first use of coke in an iron furnace occurred around 1817 at Isaac Meason's Plumsock puddling furnace and rolling mill in Fayette County, Pennsylvania. In the late 19th century, the coalfields of western Pennsylvania provided a rich source of raw material for coking. In 1885, the Rochester and Pittsburgh Coal and Iron Company constructed the world's longest string of coke ovens in Walston, Pennsylvania, with 475 ovens over a length of 2 km (1.25 miles). Their output reached 22,000 tons per month. The Minersville Coke Ovens in Huntingdon County, Pennsylvania, were listed on the National Register of Historic Places in 1991. Between 1870 and 1905, the number of beehive ovens in the US skyrocketed from about 200 to almost 31,000, which produced nearly 18,000,000 tons of coke in the Pittsburgh area alone. One observer boasted that if loaded into a train, “the year's production would make up a train so long that the engine in front of it would go to San Francisco and come back to Connellsville before the caboose had gotten started out of the Connellsville yards!” The number of beehive ovens in Pittsburgh peaked in 1910 at almost 48,000. The industrial production of coke from coal is called coking. The coal is baked in an airless kiln, a "coke furnace" or "coking oven" at temperatures as high as 2,000 °C (3,600 °F) but usually around 1,000–1,100 °C (1,800–2,000 °F). This process vaporizes or decomposes organic substances in the coal, driving off volatile products, including water, in the form of coal-gas and coal-tar. The non-volatile residue of the decomposition is mostly carbon, in the form of a hard somewhat glassy solid that cements together the original coal particles and minerals. Some facilities have "by-product" coking ovens in which the volatile decomposition products are collected, purified and separated for use in other industries, as fuel or chemical feedstocks. Otherwise the volatile byproducts are burned to heat the coking ovens. This is an older method, but is still being used for new construction. 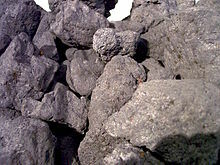 Bituminous coal must meet a set of criteria for use as coking coal, determined by particular coal assay techniques. These include moisture content, ash content, sulfur content, volatile content, tar, and plasticity. This blending is targeted at producing a coke of appropriate strength (generally measured by coke strength after reaction), while losing an appropriate amount of mass. Other blending considerations include ensuring the coke doesn't swell too much during production and destroy the coke oven through excessive wall pressures. The greater the volatile matter in coal, the more by-product can be produced. It is generally considered that levels of 26–29% of volatile matter in the coal blend are good for coking purposes. Thus different types of coal are proportionally blended to reach acceptable levels of volatility before the coking process begins. The different macerals are related to source of material that compose the coal. However, the coke is of wildly varying strength and ash content and is generally considered unsellable except in some cases as a thermal product. As it has lost its volatile matter, it has lost the ability to be coked again. The "hearth" process of coke-making, using lump coal, was akin to that of charcoal-burning; instead of a heap of prepared wood, covered with twigs, leaves and earth, there was a heap of coals, covered with coke dust. The hearth process continued to be used in many areas during the first half of the 19th century, but two events greatly lessened its importance. These were the invention of the hot blast in iron-smelting and the introduction of the beehive coke oven. 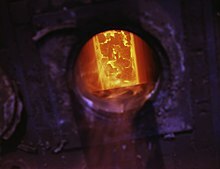 The use of a blast of hot air, instead of cold air, in the smelting furnace was first introduced by Neilson in Scotland in 1828. The hearth process of making coke from coal is a very lengthy process. A fire brick chamber shaped like a dome is used, commonly known as a beehive oven. It is typically 4 meters (13.1 ft) wide and 2.5 meters (8.2 ft) high. The roof has a hole for charging the coal or other kindling from the top. The discharging hole is provided in the circumference of the lower part of the wall. In a coke oven battery, a number of ovens are built in a row with common walls between neighboring ovens. A battery consisted of a great many ovens, sometimes hundreds, in a row. Coal is introduced from the top to produce an even layer of about 60 to 90 centimeters (24 to 35 in) deep. Air is supplied initially to ignite the coal. Carbonization starts and produces volatile matter, which burns inside the partially closed side door. Carbonization proceeds from top to bottom and is completed in two to three days. Heat is supplied by the burning volatile matter so no by-products are recovered. The exhaust gases are allowed to escape to the atmosphere. The hot coke is quenched with water and discharged, manually through the side door. The walls and roof retain enough heat to initiate carbonization of the next charge. When coal was burned in a coke oven, the impurities of the coal not already driven off as gases accumulated to form slag, which was effectively a conglomeration of the removed impurities. Since it was not the desired coke product, slag was initially nothing more than an unwanted by-product and was discarded. Later, however, it was found to have many beneficial uses and has since been used as an ingredient in brick-making, mixed cement, granule-covered shingles, and even as a fertilizer. People can be exposed to coke oven emissions in the workplace by inhalation, skin contact, or eye contact. The Occupational Safety and Health Administration (OSHA) has set the legal limit for coke oven emissions exposure in the workplace as 0.150 mg/m3 benzene-soluble fraction over an eight-hour workday. The National Institute for Occupational Safety and Health (NIOSH) has set a Recommended exposure limit (REL) of 0.2 mg/m3 benzene-soluble fraction over an eight-hour workday. Coke is commonly used as fuel for blacksmithing. Coke was used in Australia in the 1960s and early 1970s for house heating. Since smoke-producing constituents are driven off during the coking of coal, coke forms a desirable fuel for stoves and furnaces in which conditions are not suitable for the complete burning of bituminous coal itself. Coke may be combusted producing little or no smoke, while bituminous coal would produce much smoke. Coke was widely used as a substitute for coal in domestic heating following the creation of smokeless zones in the United Kingdom. Highland Park distillery in Orkney roasts malted barley for use in their Scotch whisky in kilns burning a mixture of coke and peat. Coke may be used to make synthesis gas, a mixture of carbon monoxide and hydrogen. Wastewater from coking is highly toxic and carcinogenic. It contains phenolic, aromatic, heterocyclic, and polycyclic organics, and inorganics including cyanides, sulfides, ammonium and ammonia. Various methods for its treatment have been studied in recent years. The white rot fungus Phanerochaete chrysosporium can remove up to 80% of phenols from coking waste water. The bulk specific gravity of coke is typically around 0.77. It is highly porous. The most important properties of coke are ash and sulfur content, which are dependent on the coal used for production. Coke with less ash and sulfur content is highly priced on the market. Other important characteristics are the M10, M25, and M40 test crush indexes, which convey the strength of coke during transportation into the blast furnaces; depending on blast furnaces size, finely crushed coke pieces must not be allowed into the blast furnaces because they would impede the flow of gas through the charge of iron and coke. 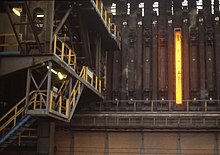 A related characteristic is the Coke Strength After Reaction (CSR) index; it represents coke's ability to withstand the violent conditions inside the blast furnace before turning into fine particles. The water content in coke is practically zero at the end of the coking process, but it is often water quenched so that it can be transported to the blast furnaces. The porous structure of coke absorbs some water, usually 3–6% of its mass. In more modern coke plants an advanced method of coke cooling uses air quenching. Bituminous coal must meet a set of criteria for use as coking coal, determined by particular coal assay techniques. See Section "Production". The solid residue remaining from refinement of petroleum by the "cracking" process is also a form of coke. Petroleum coke has many uses besides being a fuel, such as the manufacture of dry cells and of electrolytic and welding electrodes. Gas works manufacturing syngas also produce coke as an end product, called gas house coke. Fluid coking is a process which converts heavy residual crude into lighter products such as naphtha, kerosene, heating oil, and hydrocarbon gases. The "fluid" term refers to the fact that solid coke particles behave as a fluid solid in the continuous fluid coking process versus the older batch delayed-coking process where a solid mass of coke builds up in the coke drum over time. ^ "CCHC—Your Portal to the Past". Coal and Coke Heritage Center. Penn State Fayette, The Eberly Campus. Archived from the original on 23 May 2013. Retrieved 19 March 2013. ^ a b Peckham, Stephen (1880). Special Reports on Petroleum, Coke, and Building Stones. United States Census Office. 10th census. p. 53. ^ Nersesian, Roy L (2010). "Coal and the Industrial Revolution". Energy for the 21st century (2 ed.). Armonk, NY: Sharpe. p. 98. ISBN 978-0-7656-2413-0. ^ Cooper, Eileen Mountjoy. "History of Coke". Special Collections & Archives: Coal Dust, the Early Mining Industry of Indiana County. Indiana University of Pennsylvania. Archived from the original on 2015-02-10. ^ Wittcoff, M.M. Green ; H.A. (2003). Organic chemistry principles and industrial practice (1. ed., 1. reprint. ed.). Weinheim: Wiley-VCH. ISBN 978-3-527-30289-5. ^ a b c Beaver, S. H. (1951). "Coke Manufacture in Great Britain: A Study in Industrial Geography". Transactions and Papers (Institute of British Geographers). The Royal Geographical Society (with the Institute of British Geographers (17): 133–48. doi:10.2307/621295. JSTOR 621295. ^ DiCiccio, Carmen. Coal and Coke in Pennsylvania. Harrisburg, PA: Pennsylvania Historical and Museum Commission. ^ A subsidiary of the Buffalo, Rochester and Pittsburgh Railway. ^ Eavenson, Howard N. (1942). The First Century and a Quarter of American Coal Industry. Pittsburgh, PA: Waverly Press. ^ Warren, Kenneth (2001). Wealth, Waste, and Alienation: Growth and Decline in the Connellsville Coke Industry. Pittsburgh, PA: University of Pittsburgh. ^ a b Martin, Scott C. Killing Time: Leisure and Culture in Southwestern Pennsylvania, 1800–1850. Pittsburgh, PA: University of Pittsburgh Press. ^ "Coal and Steel". World Coal Association. 2015-04-28. Archived from the original on 2012-03-14. ^ "Cokemaking: The SunCoke Way". Archived from the original on 2016-06-03. ^ "Coal Grades" Archived 1 February 2016 at the Wayback Machine,"Ministry of Coal"
^ "Manufacture of Coke at Salem No. 1 Mine Coke Works". Pathoftheoldminer. Archived from the original on 2013-07-03. ^ "Coke Ovens". The Friends of the Cumberland Trail. Archived from the original on 2012-06-25. ^ "CDC – NIOSH Pocket Guide to Chemical Hazards – Coke oven emissions". www.cdc.gov. Archived from the original on 2015-11-23. Retrieved 2015-11-27. Chisholm, Hugh, ed. (1911). "Coke" . Encyclopædia Britannica. 6 (11th ed.). Cambridge University Press. p. 657. ^ The Scotch Malt Whisky Society: Highland Park: Where the peat still reeks in the old way "The Scotch Malt Whisky Society - USA". Archived from the original on 2011-07-16. Retrieved 2011-02-22. ^ "Cutting-Edge Solutions For Coking Wastewater Reuse To Meet The Standard Of Circulation Cooling Systems". www.wateronline.com. Archived from the original on 2016-08-15. Retrieved 2016-01-16. ^ Jin, Xuewen; Li, Enchao; Lu, Shuguang; Qiu, Zhaofu; Sui, Qian (2013-08-01). "Coking wastewater treatment for industrial reuse purpose: Combining biological processes with ultrafiltration, nanofiltration and reverse osmosis". Journal of Environmental Sciences. 25 (8): 1565–74. doi:10.1016/S1001-0742(12)60212-5. ^ Güçlü, Dünyamin; Şirin, Nazan; Şahinkaya, Serkan; Sevimli, Mehmet Faik (2013-07-01). "Advanced treatment of coking wastewater by conventional and modified fenton processes". Environmental Progress & Sustainable Energy. 32 (2): 176–80. doi:10.1002/ep.10626. ISSN 1944-7450. ^ Wei, Qing; Qiao, Shufeng; Sun, Baochang; Zou, Haikui; Chen, Jianfeng; Shao, Lei (2015-10-29). "Study on the treatment of simulated coking wastewater by O3 and O3/Fenton processes in a rotating packed bed". RSC Advances. 5 (113): 93386–93393. doi:10.1039/C5RA14198B. ^ Lu, Y; Yan, L; Wang, Y; Zhou, S; Fu, J; Zhang, J (2009). "Biodegradation of phenolic compounds from coking wastewater by immobilized white rot fungus Phanerochaete chrysosporium". Journal of Hazardous Materials. 165 (1–3): 1091–97. doi:10.1016/j.jhazmat.2008.10.091. PMID 19062164. Wikimedia Commons has media related to Coke (fuel).